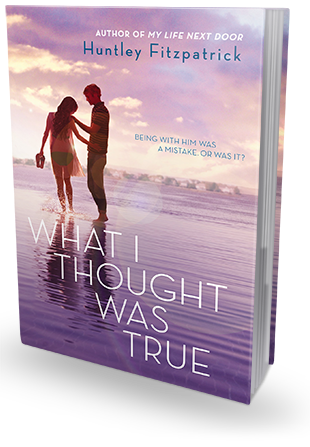 A magnetic, push-you-pull-me romance with depth, this is for fans of Sarah Dessen, Jenny Han, and Deb Caletti. "What means I have to, like, boil these suckers. I know I'm a disgrace to seven generations of Portuguese fisherman, but putting something alive into boiling water? I'm not - it's just- I mean, what a way to go-" I look up at Cass, expressionless except for one slightly raise eyebrow, and clamp my mouth shut at last. I leaned forward without meaning to, without a clear thought in my head, and he bent forward and kissed me. It was such a good, sweet kiss - a simple press of the lips at first until I opened, wanting more, and he was ready. No jamming tongues or bumping teeth. Just one smooth delicious glide and then a rhythm that made my insides jangle and had me tilting against him, gasping for breath, then diving back for more. He hands the clippers to e, pulling his hands back quickly and shoving them in his pockets. Then he studies my fact. "Actually, you do seem to be enjoying yourself. Too much. You are planning to use those on the hedge, right? Not on me?" "Hmmm. That hand't occurred to me." I turn the hedge clippers on and look him over speculatively. He bends down, wrenches the plug out of the wall. "I was seventeen once too," my father begins unpromisingly. "And I took a ton of girls to the beach late at night-"
"That's great, Dad. You can tell us about it another time." I pull Cass out the door as Mom says, "A ton? That's a bit much, Mike. It was just me and that trashy Candy Herlihy." Right off the bat, What I Thought Was True is a great summer read, and not just because it takes place in the summer. Huntley has a knack for writing books that are just fun and easy to read. I'll admit that I've had this book on my shelf for quite a bit and while I was searching for that perfect hammock book one Saturday morning, it just grabbed me. Gwen is coming off a rough past couple months, but Huntley keeps us in the dark as to what happened, slowly unfurling her past in flashbacks. All we know is that when a couple guys her age show up at her dad's and send a few suggestive comments her way, she gathers her little brother, Emory, and hightails it out of there. Gwen is an islander, "the people who mow the lawns and fix and paint and clean the houses," and lives in a small two bedroom house with her mother, grandfather, cousin Nic, and younger brother (her parents are divorced and her father lives in a small place by the ocean), where they all struggle to get by in part to Emory's growing medical bills. While they are a close knit family, Gwen is desperate to leave her "heaven by the water" for a new life. After accepting the job of a daytime caretaker for an elderly woman on the island, Gwen finds herself constantly running into Cassidy Summers, a classmate she has been avoiding, for reasons unknown to us. Cass is "not an islander" and his family is very wealthy and he, along with his friend Spence, only go to the local public school because they were kicked out of the wealthy private school. The beautiful thing about these two characters and their relationship is the realism Huntley brings to it. They're flawed and teenagers. Gwen is strong, witty, and at a time in her life where not much makes sense and is rather insecure about it. Cass himself is insecure, but is also polite and honest. They already have a history between them, but the (new?) romance is slow and innocent. Gwen is wary of Cass, but the more she gets to know him and sees him interact with her family, especially Emory, she begins to trust him and fall for him. The relationship between not only Gwen and Cass is real, but those of the people surrounding them as well and not just the romantic ones either. Gwen has a loving relationship with her family and it shows in her interactions with them. (Side note: Yea for a YA book that has the family not only present and accounted for, but having a huge role within the book!) One of my favorites though has to be the interactions between Gwen and Mrs. Ellington, the woman Gwen is working of over the summer. This woman may be into her 90s, but she is funny and remembers what it was like to be young and in love. Smart as a whip, too. What I Thought Was True was long, maybe too long. There felt like a lot of down time where things weren't happening. I like how the history of Gwen and Cass is told in flashback as they were forming their new relationship, but there were definitely times were the plot dragged and I found my mind wandering. There are also a lot of side-plots, which was another true to life aspect, but they took away from Cass and Gwen too much. Huntley's writing is good and she does a great job of creating a variety of characters for us to connect with and adding plenty of depth, but I'm left with a feeling that there's something missing.